Enter a world rich and strange – even the cover art suggests this even before you read a word! But it’s stranger – and scarier – that you might imagine. The opening piece of fiction sets the scene: a heady mix of warfare, implacable enemies, fighting machines… and yet at the core human beings, maybe a bit different but still real people who care, who love, who hate… and have nightmares afterwards. Then Chapter 1 bids us Welcome. Welcome to a near-future alternate world in which giant mecha, magic, technology and unspeakable horror are melded together mixing That Which Should Not Be with hopes, harbored by all who go to war, that better times are just around the corner. It begins by explaining unfamiliar terms, both those of role-playing and those specifically for this setting. Now obscure references in the opening fiction become clear – not, alas, the sidebar text, small black text on a strident and messy dark pink background is not conducive to clarity: rather a shock in a work where excellent design is otherwise evident. Many of the references are familiar if you happen to read Lovecraft – Cthulhu himself, and many of the cults and dark gods that lurk around – and others if you care for anime and mecha in general. It moves on to detail some of the sources that inspired this game, and which in turn may also inspire players of it. Fascinating, while many games give a reference list, here there are notes about what in the game was inspired and drew upon each work mentioned. Next comes Chapter 2: That Was Then, This Is Now presents a ‘historical’ timeline starting about now, and postulating a future in which what we’ve already read has come to pass. Political bickering is commonplace, but who would think the seeds of this alternate future were sown by a translation of an ancient German treatise that inspired a graduate student of mathematics to explore strange geometries? A seeming golden era of new technology is soon blighted by alien invasion guided by a truly weird race, the Migou, who live on Pluto and feel threatened by humanity’s rapid development… so create an entire bioengineered alien ‘species’ to do the invading for them, complete with a fabricated backstory about where they came from and what they want. 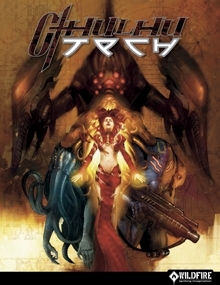 These ‘Nazzadi’ eventually rebel and join forces with humans, while worshipers of unspeakable deities explore rituals to bring their gods back to life and corporations seek profit and a world government arises grabbing all control from everyone else… and out of this nightmare comes the alternate reality in which the game is set. A frighteningly coherent account that just could happen, did the more mystical bits have any basis in reality. The timeline is followed by more detailed discussion of the global New Earth Government – which is actually a quite enlightened one in which an individual is judged solely on merit, with none of the baggage about race, gender, sexuality, and the like. This moves on rapidly to an explanation of the current workings of the NEG armed forces, and next the Ashcroft Foundation and arcanotechnology – the science/magic fusion based on the works of that long-insane graduate student (who was called Ashcroft…) – are examined. Some claim the Foundation controls the government, they are at best intricately entwined. Throughout this part of the chapter, sidebar boxes contain rumors – if you can read them – which can spawn adventures or entire plotlines. Next comes another organization, the Engel Project. Only some half-dozen years old, its effects are already profound. Through arcane ritual and technology, they’ve developed the Engels – a fusion of human operator and living construct, made up of both organic and artificial mecha-like components. Due to the construct’s innate aggressiveness, each human operator needs implants attuned to a specific Engel to control it adequately, else it can run amok! Then another major corporation is explored, the Chrysalis Corporation – which has the slight problem of having been infiltrated and taken over by a cult called the Children of Chaos with their own occult agenda. Using the ancient Rite of Transfiguration ordinary mortal humans are turned into shape-shifting monsters called Dhohanoids… and if that’s not enough, they’re opposed by the Eldritch Society who likewise wield occult powers in an attempt to get their own way! They also transform dedicated members, into what are called Tager, melded with trans-dimension symbionts to form what might best be regarded as a living mecha. Rounding up with a run-down of the Nazzdi, the Migou themselves and information about lifestyles and attitudes of the civilian population of Earth, the chapter presents an evocative glimpse of the world in which your character will live, a considered and detailed setting within which it is already apparent that a multitude of stories can be told. Chapter 3: The Art of the Game begins to look at how it all works. 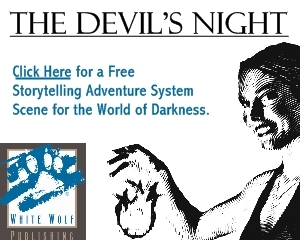 Here is a wealth of detail about how storytelling, role-playing games are played. It’s just a couple of pages, but one of the more accessible and clear descriptions of just what you are letting yourself in for that I’ve read in a long time! So, onto the meat of the thing as Chapter 4: Framewerk explains the core rule mechanics of this game. It’s a cinematic system based on d10s, with the basic concept that the higher the number, the better. Like any system, the fundamental bit is how you resolve the outcome of whatever action it is your character is trying to perform. All the rest is fine-tuning and explanation of how the resolution is reached. In Framewerk this is called a Test, which has a Degree and a Difficulty, assigned by the Storyguide (GM) based on how hard the thing the character wants to do is, and the circumstances in which the attempt is being made. You use your character’s most appropriate Attribute as the Base, and then add dice equal to his expertise in whichever of his Skills is most relevant. If you have a specialization within that Skill that is aimed at the task being attempting you may get a bonus die or two. Roll the dice and try to beat the Difficulty… but there are THREE ways you can read your dice! Take the highest single roll in the handful. Or take the number that’s been rolled most often and add them together (i.e. if you rolled two 4s, you’ve got 8). Or you can add up the components of a ‘straight’ (run of consecutive numbers). Add the number you come up with – whichever method you pick – to your Base, and see if you’ve got over the Difficulty (but watch out for 1s, they’re bad news!). There are plenty of examples to show you how it all works, and discussions of exceptions and variations, but once you’ve got this core concept you should be up and running. Next, Chapter 5: Alter Ego explains how to create a character. Before you start codifying him in numbers, of course, you’ll need to decide on the underlying concept: race, profession, which groups he belongs to or allegiances he might hold… which may be best discussed with other players and with the Storyguide, who may already have a plot in mind so will need characters who will fit in. But you start the creation process, once these matters have been decided, by picking your character’s ‘Defining Characteristics’ – two things, one good (a Merit) and one not (a Flaw), that sum him up. He might be courageous but lazy, generous but irreverent… that sort of thing. Next, determine his Attributes – is he smart, strong, etc.? – the innate abilities and characteristics that he has, on a 1-10 scale using a point buy system, 35 points to divide between six Attributes. Then he needs to be kitted out with Skills, again using point-buy. So character creation is a matter of choice rather than chance. Some ‘skill packages’ are provided, reflecting the likely skills an individual in that trade might have, or you can pick from a comprehensive master list. A good 2-page summary is provided to lead you through the process, while the rest of the chapter looks at the fine detail. Right at the end of the process, there’s a further point-buy customization option called Cheats, where you can tweak virtually anything. Then there’s a bunch of questions to help you turn the character from a sheet-full of numbers into a person ready to play. Summaries of options available and the mechanism for improving your character through play and experience are also discussed. Next, Chapter 6: Skillz covers the skills available including ways in which they can be used during the game. Chapter 7: Qualities does the same service for the Assets and Drawbacks which you can choose to manipulate the points available for skill purchase during character creation. Learn how to make them a part of his behavior and style rather than mere words on the character sheet. A good start is to come up for the reason why he has the specific asset or drawback you’ve chosen. Chapter 8: The Way of the Future looks at the technological advances that have taken place and examines the sort of equipment, weapons, and tools that are available. Possibly the most dramatic development has been that of cheap energy, revolutionizing everything from transportation to manufacturing. But this isn’t a just mere ‘shopping list’ of future tech your character can collect, it is a wide-ranging almost philosophical treatise on how such advances have changed society, and provides important resources to help in the creation of the ‘alternate reality’ in which your characters will exist. All RPGs involve combat, and this one is certainly no exception! Chapter 9: Life, Death and Madness explores every aspect from conducting a brawl to healing resulting injury, as well as dealing with the consequences of illness and other natural hazards characters might encounter. A fight is handled turn by turn, with characters acting in initiative order, resolving each action they take when it is their go. Multiple actions can occur, but each character gets one before those capable of more can act again in the same round, and any character can take a defensive action against a direct attack even after he’s performed all the actions he’s capable of in a round (unless he’s been taken by surprise, of course). Laid out it sound clunkier than it actually is once you get a few characters and try it out. There’s plenty of detail here to cover most eventualities, and many of the physical activities – like climbing and running – that characters will wish to engage in. Mecha combat is handled separately, but follows the same general concepts, although they go to the repair shop rather than the hospital afterwards. As we’re dealing with Things That Should Not Be in this game, there are also rules for fear and insanity. Gibber. Fortunately, psychiatric treatment is quite advanced in this future, so there is hope for characters sent round the bend by what they’ve encountered in the game. Next, Chapter 10: The New War Machine gets to grips with matters mecha. Starting with the claim that the invention of mecha brought about the greatest change to warfare since the invention of gunpowder, the chapter looks at the mecha on both sides, and at the underlying components that go to make one up. The Tager are included, even though they aren’t strictly speaking mecha but symbionts, as they work pretty much the same way. The components used in mecha construction are presented so that gearheads will find it easy to design their own, if they don’t want to use the standard ones outlined here… and there are plenty of them! Combat gearheads hopefully satisfied for now, Chapter 11: Blasphemous Whispers looks at the rise of magick, and the art of the sorcerer. To start with, the study and use of magick is controlled and licensed, and – as a short piece of fiction emphasizes – you can get in trouble if caught dabbling without the proper authorization. However, if you are content to operate within the rules, you can take magick courses at college and seek employment with the government or private corporations, just like those who prefer more mundane areas of study. Those who study magick are soon immersed in strange and ancient languages, multiple dimensions and long-lost dark gods. They’ll find, of course, that not all rituals or magickal tomes can be obtained legally – the government maintains that those it restricts or bans are just too dangerous to let anyone have. And mostly that’s true, magick is a deadly art. A collection of some of the books that you might encounter in the course of your studies is presented here in a common format… most are illegal, at least in their uncensored form. And then on to the rules for magick. It’s all done by rituals, no simple handwave and a couple of words. Still there are plenty of things you can do, and a wealth of spells to acquire and learn… and a scary list of things that can go wrong during spellcasting! 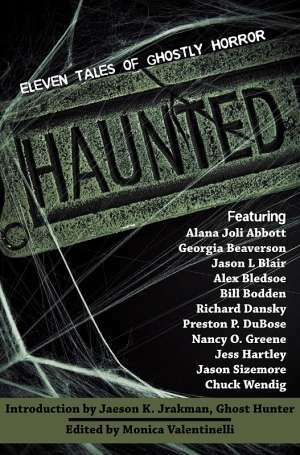 Next is Chapter 12: Unspeakable Horrors. Now the Cthulhu Mythos has always been crawling with them… but in this future many such nightmares have crawled out of the pages of literature and legend and walk the earth, and this chapter contains the details the Storyguide needs to handle them when they do. Vile as they may be, some of the illustrations are quite beautiful, strangely evocative – unlike the boring mecha ones – but suffer a few layout problems sometimes obscuring parts of the text. Most of these dark creatures have allegiance to one or other faction, and there are some helpful hints for using them to good – scary – effect in your game, from the way in which you indicate their presence or describe them to the rule mechanics for engendering fear in the characters. They ought never to become everyday, commonplace, however badly you have decided your world is infested by them. Introduced by a spectacular piece of chase/combat fiction, next is Chapter 13: Vehicular Homicide. Technological advances have revolutionized vehicle design, or at least, the way in which they are powered. You still have a range of transport devices from motorcycles and cars through trucks, bulk personnel carriers and the like, as well as those vehicles designed for war, though: and there are details of a sufficient selection to fill the roads of your world given here. Many merge ground and air capabilities, and weapons and armor are common additions. It may seem that everything about the world has been described in considerable detail already, yet Chapter 14: Parting the Veil is marked for the Storyguide alone and launches off into the secret history of the world. The stuff that’s gone before is the ‘common knowledge’ of the times, but not completely accurate… and despite conspiracy theorists, some of it isn’t actually known to anyone: well, unless they’re the Storyguide! So here’s the low-down, who the various players are (especially the really powerful ones classed as ‘gods’), secret places, other dimensions and eldritch power are all discussed. One delight is a rationale for why stars have so much significance for ritualists and astrologers… apparently they serve as rips or portals between the dimensions, as well as being the balls of burning gases which science describes. The sources and inspiration for this ‘world view’ are a cunning blend of Lovecraft, the Hebrew Kabbalah and Gnostic beliefs, and the authors wisely state that it’s fiction and not intended to reflect reality or disrespect any other religious beliefs. This leads neatly on to Chapter 15: The Honoured Guide. Some of the advice herein is relevant whatever game you GM, and other bits are specifically honed towards running CthulhuTech in particular. There’s a handy checklist of what a GM needs to do before, during and between game sessions, which encapsulates what you’re taking on neatly. Advice on focussing on the player-characters is followed by quite detailed – and useful – material on crafting good stories from the structural point of view: it’s easy to have a neat plotline, but can be harder to deliver it in a manner that will engage your players over several weeks or months. Ways of handling this structure in the heroic/mythic style and methods of involving themes from the diverse inspirations for this game are covered, it’s quite a fascinating read – and shows that blending anime and eldritch horror CAN work if you think about it the right way. There are many different stories to tell, depending on what areas you and your group want to explore, and there are plenty of suggestions to get you started (and to make me reach for the plotbook even before I finish writing this review!). There’s also hints about designing and running the Supporting Cast (NPCs) and awarding experience to your players and overseeing character advancement. This is followed by Chapter 16: The Population – a ready-made bunch of NPCs all ready to go. Introduced by a ‘news report’ (which incorporates some of the preceding bits of fiction) Chapter 17: War, Fear and Vendetta presents a couple of ready-made scenarios to get your game going, as well as some story seeds to spark ideas for your own adventures. The first is called Death and Victory and sends mecha pilot characters on a quest to retrieve an artifact of arcane power. There’s plenty of opportunity for role-play as well as combat, including a neat way to ensure that players are comfortable with mecha combat before getting to the meat of the adventure. The format is crisp, with key points clearly given and significant individuals and events laid out, yet loose enough to allow the Storyguide to take the framework and run with it. However, unlike the rest of the book, this section could do with some proofreading, it’s littered with annoying grammatical errors. For those preferring a game based around the Eldritch Society and its search for the unknown, rather than mecha, the second adventure Hot Merchantise is provided. Again brawling and interaction are reasonably balanced as the characters search for another arcane artefact, and this adventure is open-ended enough to serve as the beginning of an extended campaign. Both are set in the Pacific Northwest region – if like me you don’t know it, Google Maps are your friend. Each story hook is designed for a different type of game, so whatever you fancy there should be something for you (or some scope to help you decide your preferences). Stylishly-presented and with great internal consistency, this game is ripe with possibilities for all manner of play styles in a dark future, and is especially recommended if you like gothic horror in a modern setting with a spot of wild anime action, perhaps an unlikely mix but one which works surprisingly well.